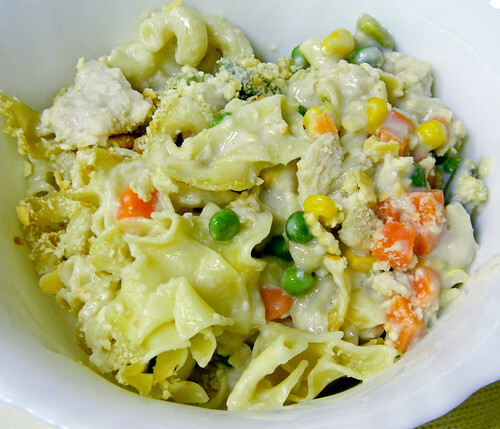 Chicken Noodle Casserole | What Smells So Good? I have a secret - I have never eaten Tuna / Turkey / Chicken Casserole. Ever. I have a very strong aversion to fish with anything "creamy", and really, the thought of gooey, canned-soupy noodles, frozen vegetables and overcooked protein with a crumby crust on top just never sat well with me. So why am I giving you a recipe for the very thing I detest? Well, for one, I know it's a popular dish, and it's one my mom loves even today. She never made it at home for us kids (probably because my picky sister would kill her if she tried) and so I never had the opportunity to try it, nor did I ever learn to make it. Then I got to work one week to discover that that week's menu included one lunch of Tuna or Chicken Noodle Casserole. It was the strangest thing to research how to actually put one together (not so much the ingredients, but the baking time), since it's a recipe that's almost a given that everyone should be able to make with their eyes closed. Thankfully my life was made a lot easier by my involvement in the #SundaySupper Movement, since one of our roundups in January included "A Retro Throwback of Tuna Noodle Casserole for #SundaySupper" by Country Girl in the Village. I basically followed Shannon's recipe, with the exception that I had to use a combination of noodles rather than just egg (we didn't have enough), used "mixed" vegetables for the peas and used half mushroom, half chicken cream soup. Our school has three fish-allergic children so even though I could have made them a separate dish, I saved myself the cleanup and did 100% chicken instead. And yes, it was canned chicken. How much more retro can you get? In a large bowl, mix the soups, cornstarch and milk until smooth. Add the chicken, noodles and vegetables and fold through to coat well. Pour into a greased 9x13" pan. Top with the crushed crackers. Bake for 1 hour. Let stand 5 minutes before serving.